Project-Based Living – Page 3 – Rethinking the way we look at the school/life intersection. It’s happened to us all. We have all been in groups that have been challenged to do something without a defined process. The trick is, I bet you or a group member had developed a toolkit to turn your group work into a collaborative relationship. Flipping the script, many times students do not have the tools or developed the ability to activate prior supports to truly live in a collaborative ecosystem. Just putting students at the same table is not enough. I know I’m being a bit dramatic here, but further more, we must continue to examine how as educators we can swing the pendulum away from group work and more towards a collaborative nirvana. Here are a couple thoughts around building a collaborative ecosystem in a project-based learning environment. I recently read an amazing blog post from New Tech Network literacy coach Alix Horton titled, “How to Get From a Rubric to Scaffolding“. She outlines a very simple process to take a rubric indicator and transform it into an actionable activity. I believe this is a great starting point for growing your philosophy on building collaboration. Many times we forget the true value and role that skills play in promoting deeper learning. By developing a “spectrum of scaffolding” you will be able to help facilitate students in moving from just working in groups to a collaborative team. Acknowledges and helps clarify the ideas of others by asking probing questions. There are a plethora of scaffolding activities that could promote building this skill in teams. For example, at the beginning of a project, I could introduce teams to accountable talk stems. Throughout the project, I could do informal data collection on how many groups are utilizing the stems to promote civil discourse (Step 2 in cycle). As an extention of developing this skill, I might hold a Socratic Seminar or have 1-on-1 confrencing with each group to assess how the stems are leading to deeper questions (Step 3 in cycle). Lastly, in planning the next project, I will want to reflect on the effectiveness of using accountable talk to promote probing questions in group collaboration. I will examine how to extend this skill by potentially scaffolding the stems by having teams use the question formulation technique (QFTs) with accountable talk to develop questions (Step 4 in cycle). Now of course, I know the above scenario isn’t perfect, but I hope you get the point. When examining how to move from group work to collaboration, it is vital that you explore what specific collaborative skill you are looking to develop. Then, in relation to the spectrum of scaffolding, how might you help students create a collaborative environment to move from indicator to action to reflection to refinement to integration. I have witnessed first hand in my own projects how easy it is for group contracts to slide into the dark abyss of meaninglessness. Heck, when was the last time you looked at your own contract? The creation of group contracts in PBL has long stood as a value collaboration tool. It can set the team’s tone, layout productive processes, and create unity. However, there are many elements that can and have stifled the value of this. Seriousness, time allotted, revisiting, and staleness are just of the few barriers. It can be a very daunting task for educators and students alike to be inventive and impassioned with the same contract process over and over. What is the true purpose behind developing a group contract anyways? Is it to build a set of group norms? Is it to develop a culture of collaboration? Can it be both? I recently saw a strategy from Belleville New Tech about utilizing agency logs for students to track progress in growth mindset and ownership throughout the course of a project. This sparked my curiosity. Why don’t we flip the script with what we call “contracts” with this same mindset. 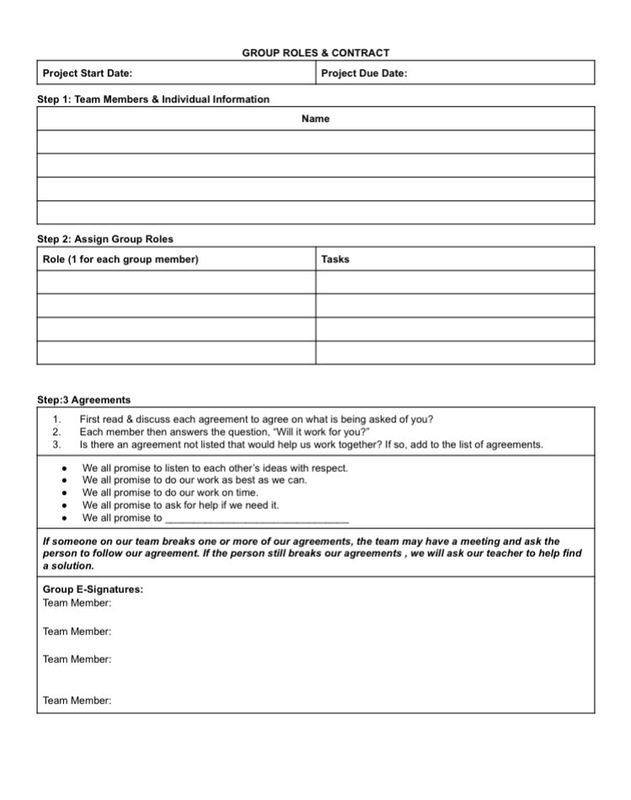 Student teams can still set goals and norms in this process, but it is extended past the fill out this contract, maybe revisit it, maybe fire someone or get fired process you see so often contracts fall into. The agency log concept makes me wonder, does the contract need to look like a contract at all? Integrating the goals of a group contact into a process that is continuous and embedded might shift the value it can play in being a true living document for collaboration efforts. Trello/Asana/Favro: these 3 are all project management tools that help teams navigate simple of complex projects. Trello and Asana have strong reputations, while Favro is a relatively new player. Slack: this is the online collaboration tool looking to bring all of your communication to one place. We rolled it out in our admin team last year and are using it as a school staff this year. I am already excited about what has come of it and potential for student use in collaboration. Wunderlist: this is a simple task manager that integrates amazingly with multiple platforms. It features both personal and shared to-do lists. As well, strategies and resources such as scrum meetings, the Project Management Institute, human-centered design, and the innovator’s compass to can also be used in non-digital ways to shift from group work to true collaboration. The point is, choose the right tools that will allow students to experience collaboration at industry standard levels. You don’t have to memic “real-world” collaboration, you can create it. The struggle is that some educators don’t ever move past basic Google tools implementation with teams because we are basic users ourselves. Just as challenging is should you have students use one collaboration tool or multiple? I don’t know if there is a right answer, but finding the optimal balance and combination that meets students need is key to actually building a collaborative environment. It is really easy to say “you do this” and “you do that” and “see you in 2 weeks” when working together. But many times, this strategy becomes group work and not collaboration. Low and behold, someone will probably show up without their part done. These resources are great starting points with students to help shift collaboration from something you do to something you live. By developing a framework for what it means to be a team and how to interact with various personalities and roles, students can better understand how to develop internal strategies to avoid separation and promote inclusion in their work. Collaboration can be a fickle peach. It is evident though that taking the time to truly create a system that develops collaboration and doesn’t just hope it happens is vital to promoting the other skills we hope to grow in students. Conflict will always exist when humans are working together, but by having a clear strategic approach, you can move from assigning group work to building a room full of collaborators with a toolkit for the future. Well it is safe to say that this post was meant to go out in June. I had officially finished my first year as a principal and this was fresh on my mind. 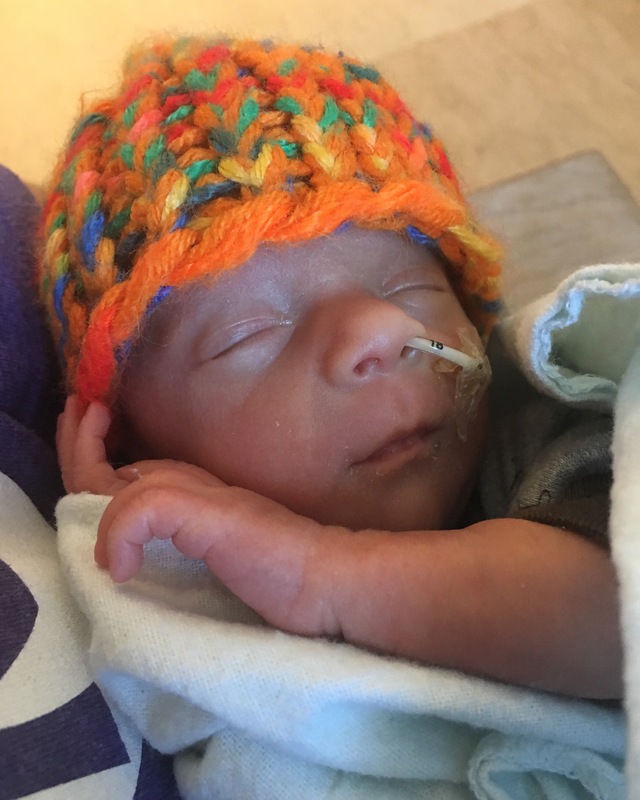 However, this little guy surprised us 10 weeks early. 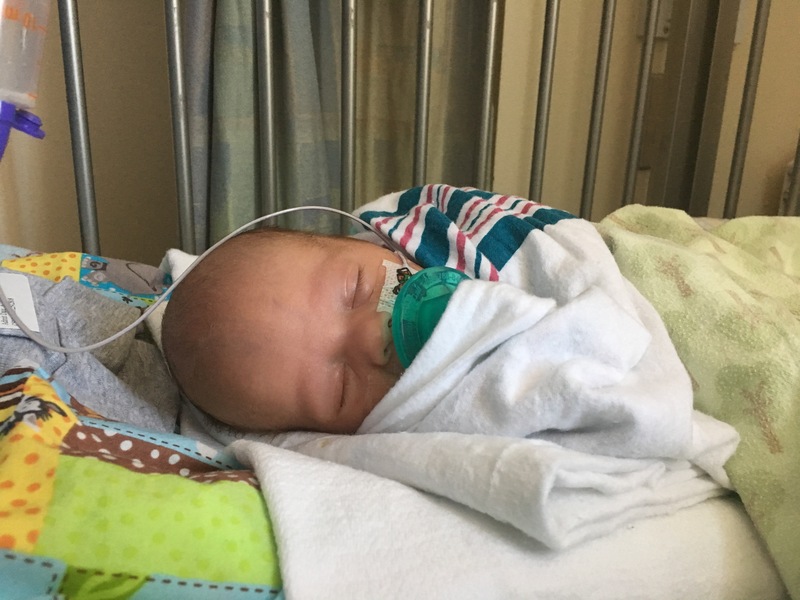 I have been blessed to see Cael grow and fight as my Summer. With that being said, I have really been able to reflect on the year and think about what I want to start, stop, and continue moving forward. I really want to start being more strategic about how I spend my time on campus. I have gotten really good at not spending much time in my office, but I feel like I learned a lot this past year about the “why” when being out and about. As any one that knows me, I LOVE spending my time with students. I not only get to know each and every one of them better, but it allows me to have a good pulse on the culture of the school. However, moving forward, I really want to start not being so random with when and why I go into certain classes. I have always had the goal to stop into every classroom at least once a day. My goal for next year is to start to be more strategic about planning my time in classrooms. I can easily say I gained even more respect for school leaders than I already had. As a teacher (and even assistant principal), I never realized the 99% of things that I didn’t have to worry about because the principal protected us from them. I learned a lot in year one about how to do this and even get more effective and efficient at allowing our staff room to iterate with a bias to action. With that being said, I have always struggled with being an over-involved person. I wouldn’t say it is as much a management thing, as it is truly my joy of contributing and collaborating. However, I learned in year one that I need to stop spending time on things that I shouldn’t be. 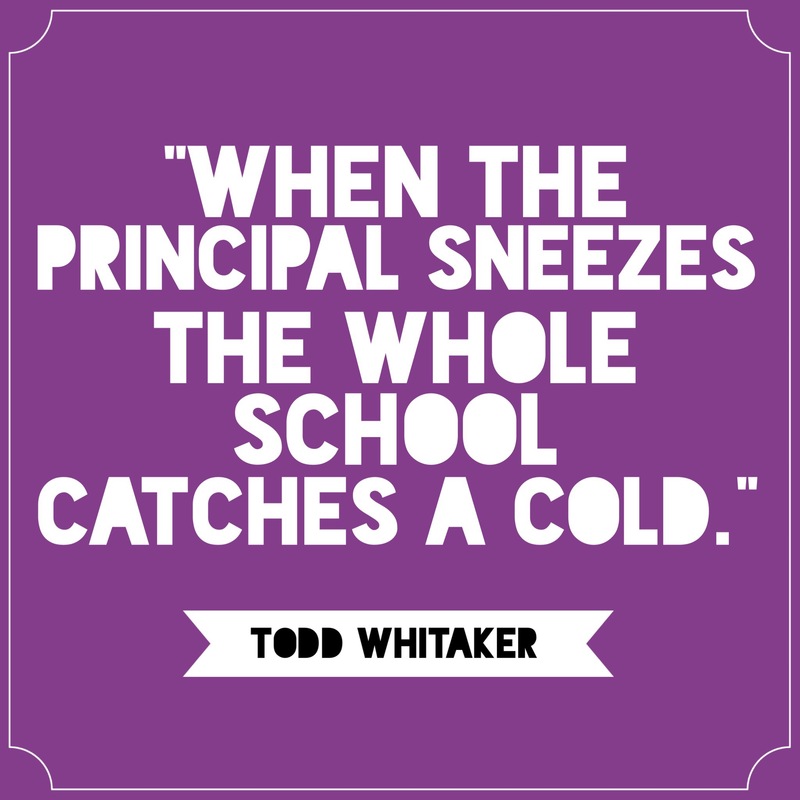 As Todd Whitaker says, “when the principal sneezes, the whole school gets a cold.” I need to be considerate of how I spend my time, energy, and resources and continue to maximize the amazing wealth of talent we have in our school. Some people will always take the principals involvement in something in a negative way or want you to have the answer if you’re at the table. Capacity-building will be vital to our success as a school and my growth as a leader. I need to build the tools and foundation for people to do their jobs and keep students at the center. Administrative tasks can feel cumbersome, but are a necessary part of the job. When and how much time we spend on them is what makes the difference. In order to prevent that cold from happening, I need to start being more mindful of how these three things impact what I can do. The 80/20 principle can help me focus in on what 20% of my work actually produces that 80%. Really digging deep into what I need to stop spending my time on will help me grow personally and help grow our school as well. There is nothing that scares me more than someone doing crappy project-based learning and thinking it’s effective or someone misidentifying what they are doing as being truly project-based learning. One thing that I will continue being is a zealot for transformative PBL experiences. Paying attention to shifts that occur in the world around us (whether it be in education or societal), will continue to be a driver for shaping my stance on the future of school and how to move to the next iteration of PBL. I want to make sure I continue rooting my beliefs in historically founded best practices (good teaching is good teaching), the current educational landscape and trends emerging, and foreshadowing the possibilities for the future direction and sustainability of “school”. Check out Getting Smart’s “It’s A Project-based World Campaign”. I will continue to be rooted in solid practices that inform teacher effectiveness, project quality, and measure student outcomes. But I also want to continue to push the envelope even further. It is true that we live in an ever shifting project-based world and I want to continue advocating for deepening the way in which we prepare students for a project-based life. I was blessed as a teacher at New Tech Academy to have great colleagues. One of them, Scott Brown, and I stumbled upon YES Prep’s Senior Signing Day. We were moved and decided to replicate it at our school. It was an amazing experience for staff and students alike. Fast forward to today. Michelle Obama’s Reach Higher Initiative has challenged schools around the country to continue to help ALL students reach their potential and pursue knowledge and growth after high school. Today at New Tech High in Napa, CA, we celebrated our first Senior Signing Day. We had over 30 students publicly pledge their commitment to the university or branch of the armed forces. The college application process is one of the most stressful experiences for any one person. Filled with indecision, nerves, and fear, it can cripple the most successful students. It also brings tears, joy, and the feeling of emptiness waiting for the acceptance letters. Today’s Senior Signing Day allowed us to grab that process by the horns and celebrate the accomplishments of the Class of 2016. It also created a benchmark for all underclassmen to strive for. “Where do I start? What questions do I have? What do I have to do to get in there? Who do I talk to?” were some of the questions I heard posed after the event. Now that is a cause worth celebrating. Note: Please see here for a list of all the students that participated and the schools they have committed to. Portfolio’s in education are not a new concept. The same thing can be said about the role of the portfolio here at New Tech High. For many schools, pulling off a successful digital portfolio program can be a daunting task. Over the course of time, New Tech High’s had grown to become a place for students to demonstrate proficiency and mastery in our school wide learning outcomes (oral communication, collaboration, etc.). However, it was clear that something was missing. For many students, portfolio become a box to check. In working with students, the New Tech High staff began exploring what the goals of a portfolio were for our school. We wanted it to be meaningful. We wanted it to be reflective. We wanted it to be holistic. We wanted it to have longevity. It is with this that I am excited to announce we have official rolled out the NEW version of portfolio at New Tech High. Now it isn’t anything earth-shattering, but it’s a big shift for us, moving from a static web design to a blog as portfolio model. Developing school wide learning outcomes. College classes and the college going process. Through scheduled blogging time and real time reflections, our portfolio experience will move from a static target to a 4 year journey. The hope would be that students take a hold of their digital footprint and have a tool that they can truly use post-high school. The “I Can Statements” will help guide the way. Current Seniors and Juniors that have not passed the old version have the opportunity to finish it or move to the new version. We haven’t quite landed on an exhibition platform yet. We envision that Open House or a Portfolio Showcase Night will be utilized in the future so students can share their work with families, friends, and community partners. We are excited to take a step into this new journey with our students. Creating an effective school communication program can be a tricky beast for any school leader to tame. However, it is vital in ensuring that all stakeholders in a school can stay in the know. At New Technology High School in Napa, CA, effective communication means having a comprehensive and all-encompassing approach to interact with our community. We know that many of our stakeholders (students, staff, parents, etc.) live on different mediums. Pew Research Center indicates that nearly two-thirds of Americans now own a smartphone (April, 2015). For this reason, it is crucial for us to make sure we utilize a variety of tools, such as Remind, social media, and our website to communicate what is happening at New Tech High so that everyone in our community has a means to access what is happening, smartphone or not. In August 2014, the Napa Valley was rocked with a 6.0 earthquake. The quake impacted many of the New Tech High families. As a school, it was vital that we were able to find a way to communicate with our students and parents. Many families were left without electricity and were unsure of what was going to happen next. It is in moments like this when a comprehensive communication plan comes into play. We were able to calm the community by communicating information about the status of the school, check on the well-being of families, and share resources for those affected. In the face of tragedy, being able to have clear lines of communication was critical. We were able to utilize Remind to communicate with our families quickly and precisely about the status of the school and emergency needs. Sending out alerts and updates allowed are families to be in the know when they needed it most. As the world of communication continues to evolve and grow around us, it is important that schools and school leaders remain flexible and adapt. Remind has been a vital tool in helping us support changing the way we can communicate with staff, students, and parents. As a school, New Tech High uses Remind in two major capacities: staff communication and school communication. We have a staff class in which I can share resources, important reminders, and action steps. This allows us to always remain clear on what needs to happen and what is most important at the top of our plate. In my first year as a principal, it has been important to constantly view myself as a learner. Frankly, I think this is a must no matter what year it is in your career, which is why this also guides my view as an effective communicator. It is necessary for a school to have a clear and concise communication plan that all stakeholders value and understand. At this same time, you cannot be committed to a plan that doesn’t work for your school community. You must always be reflecting, gaining empathy, and reiterating your plan to best meet your stakeholders’ needs. Many times, adult learning at a school can seem fragmented and random. You start out your year with a goal, but soon enough a new initiative or issue distracts you from collectively moving together on the same bus. This year, at New Tech High, we choose to utilize the driver diagram protocol to focus our adult learning as a school. The driver diagram protocol has deep roots in the medical field and public sector for helping derive a shared improvement plan. As a school, we utilized the protocol to create a shared “bus” that would drive all of our professional learning whether it be system-wide, in PLC’s, or individually. We then continued to dissect what primary drivers would systematically move us through the year together as a school. We were quick to note that we didn’t want to just settle at adult learning. Our primary drivers needed to be the same focus that we would ask our students to dive deeper into as well. New Tech High’s collective aim and primary drivers for 2015-2016. After developing the primary drivers, each of our PLC began examining what secondary drivers and change ideas would impact their work. It was important that each driver was actionable and measurable, so that we could constantly reflect and evaluate on our growth as a school. We also wanted to make sure that PLC’s had the autonomy to connect secondary drivers and change ideas that were relevant to the work they were focusing on for the year. Our school utilizes inquiry cycles to drive our learning and the driver diagram protocol supported the bias to action we were trying to create with utilizing these cycles. We are 3 weeks into the year and the drivers continue to focus and guide our work so that we can collectively drive the bus together. This protocol allows for enough flexibility and personalization that staff members can take their secondary drivers to whatever depths they like. This is perfect, because all of our work is aligned to the same primary drivers in hopes to push us towards our aim for all students. We will continue to reflect and revisit the impact that our change ideas are having on our drivers throughout the year. What I do know though, is the road is paved for us to get this bus moving into the future of education.